Kraft Jewelry Boxes, 3.25" x 2.25" x 1"
Dimensions: 3.25" x 2.25" x 1"
Kraft Jewelry Boxes, 3.5" x 3.5" x 1"
Kraft Jewelry Boxes, 5" x 3" x 1"
Dimensions: 5-7/16" x 3-1/2" x 1"
Kraft Jewelry Boxes, 8" x 2" x 1"
Black Pinstripe Jewelry Box, 3-1/4" x 2-1/4" x 1"
Dimensions: 3-1/4" x 2-1/4" x 1"
Silver Linen Jewelry Box, 3-1/4" x 2-1/4" x 1"
Gold Linen Jewelry Box, 3-1/4" x 2-1/4" x 1"
Glossy Teal Jewelry Box, 3-1/4" x 2-1/4" x 1"
Black Pinstripe Jewelry Box, 3-1/2" x 3-1/2" x 1"
Dimensions: 3-1/2" x 3-1/2" x 1"
Silver Linen Jewelry Box, 3-1/2" x 3-1/2" x 1"
Gold Linen Jewelry Box, 3-1/2" x 3-1/2" x 1"
Glossy Teal Jewelry Box, 3-1/2" x 3-1/2" x 1"
20 Each: 2-1/8" x 1-5/8" x 3/4", 2-5/8" x 1-1/2" x 1", 3-1/4" x 2-1/4" x 1"
20 Each: 3.5" x 3.5" x 1" and 8" x 2" x 1"
White Jewelry Box, 3.5" x 3.5" x 1"
White Jewelry Box, 8" x 2" x 1"
White Jewelry Box, 5-7/16" x 3.5" x 1"
Dimensions: 5-7/16" x 3.5" x 1"
Send your customers home with these attractive & sophisticated two-piece Economy Jewelry Boxes. The two-piece design allows you the freedom to mix and match lids and bases according to your store design. 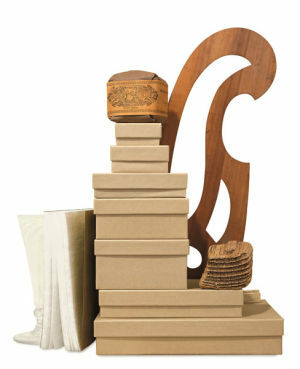 Economy Jewelry Boxes are the ideal packaging choice for Jewelry Stores, Boutiques, Gift Shops & more. The sleek design of every jewelry box will complement your store's products and existing packaging. Thanks to our 5+ color choices and 5+ different sizes, you are sure to find a color and style that fits your business needs at an affordable price. Whether you sell silver, gold, rose gold or even colorful statement jewelry pieces, our wide variety of jewelry box colors and styles help insure that your jewelry will stand out and shine. At American Retail Supply we pride ourselves in being able to provide the perfect item to fit your needs. Economy Jewelry Boxes are made from a durable chipboard that is strong enough to handle jewelry, rocks, pendants and other small & delicate items. Go a step further and use these Economy Jewelry Boxes to give personal gifts. Each jewelry box arrives with pre-fitted cotton pad to help ensure product safety. At American Retail Supply, we make it easy to find chic and classy designed jewelry boxes without having to pay a fortune. Add your own personal touch to every jewelry box by adding custom labels onto the lids. Not only will this help make your jewelry boxes memorable but can help brand your product and advertise your store!